New York, New York! With an endless array of sights to visit, places to eat, and pockets to explore, planning a trip to the big city can be overwhelming. To help sift through the options, we’ve compiled a guide of our fave Girl Gang approved spots. Old Rose is notably one of the most Instagrammable spots in the city. With its undeniably chic and charming flair, Old Rose serves up delightful morning to night Italian fare. Some of our favorites include the vodka pizza, rigatoni bolognese, and italian combo sandwich. You’d think a spot this posh would have a line out the door. To our surprise, there was no wait! Just get there earlier on the weekends and you’ll have a spot in ten. We get it. Brunch in New York is a no brainer. With a menu as sumptuous as Central Park, The Smith is a spot sure to meet everyone’s needs. If you’re feeling sweet, the cinnamon toffee brioche is a must. If you’re leaning towards something classic, their steak and eggs or BLT+E are both winners in our book. Plus, it doesn’t hurt that the interior exudes timeless brasserie vibes. Let’s face it. There’s nothing quite like brunch at Sadelle’s. In true New Yorker spirit, stop by Sadelle’s for their unbeatable bagels and lox. And yes, this is the spot you may find the Real Housewives having their Sunday bagels and mimosas. Okay, so you’re out with your girlfriends searching for a dinner spot with delectable bites, young vibes, and a good time. Fortunately, Vandal checks all the boxes. All of their dishes are meant to be shared, so order up and get a little taste of everything. Some of our most memorable favorites include the crispy bao bun sliders, fish tacos, charred brussels, wasabi pea crusted salmon, and sweet potato fries. Mouthwatering, right? Before you head out, be sure to stop by their photobooth for the cutest selfies with your best gals. If you find yourself in the Meatpacking District craving some rock shrimp and sushi rolls, look no further than Catch NYC. This hub is the quintessential hotspot for the swankiest seafood downtown. Be sure to enjoy the panoramic rooftop while savoring their truffle sashimi, crunchy rice cakes, lobster mac and cheese, and scallop gnocchi. Their flavors are outrageous and the ambiance is totally elevated. Not to mention, their desserts are out of this world. From their legendary “Hit Me” Chocolate cake to their carnival of warm ricotta donuts, Catch is a 10/10 most definitely recommend. Two words: Andy Warhol. 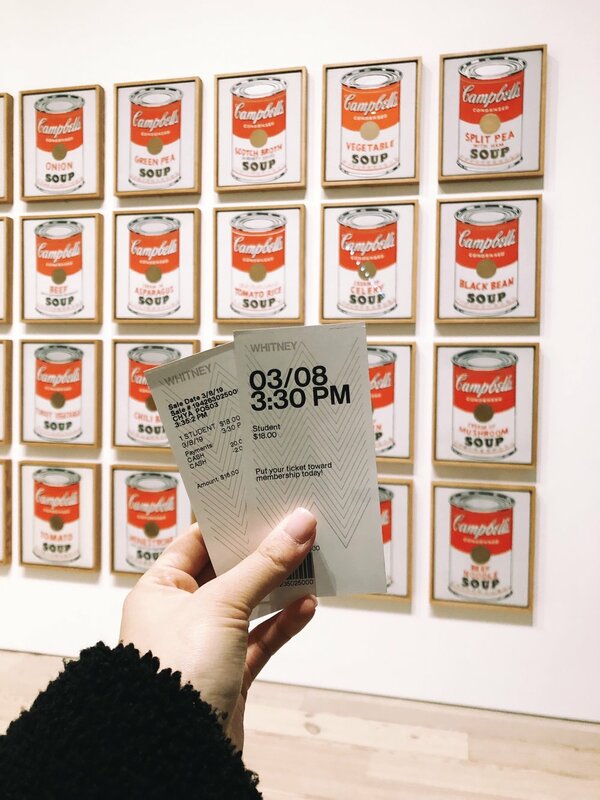 If you’re in the West Village, you have to check out The Whitney for a refined taste of American art. Besides gaining a greater appreciation for the fine arts, you can also check out the outdoor spaces for some of the most breathtaking views the city has to offer. The perfect sunset photo-op to capture the beauty and enormity of the Big Apple. “Three words. Eight Letters. Say it and I’m yours.” If you’re a Gossip Girl fan, you know just how crucial this spot was to little S + B. Residing in the Upper East Side, The Metropolitan Museum of Art encompasses the history, culture, and class of New Yorkers abound. Snap a pic on the iconic MET steps and aimlessly wander floor to floor. You’ll want to set aside a few hours to take in all the MET has to offer. Bounded by Fifth Avenue, Central Park is the city’s haven of calm serenity. Escape the hustle and bustle for an afternoon and stroll the pathways of Central Park. Insider tip: stop by Bluestone Lane on the way and pick up an oat milk latte for your wander. Who knows where a caffeine-fueled escape may lead you? Potentially to Saks on Fifth Ave? You’ve probably seen a million Instagram photos taken at this iconic pop up. This interactive art exhibit encompasses the artsy and trendy vibes of Soho to a tee. The Color Factory is an incredible hands-on experience, encouraging kids and adults alike to rekindle that childlike joy we hold dear. With 16 artfully curated rooms and some sweet treat surprises, this spot is truly a special one. Now what fun would it be if we dished on the surprises? However, we will say that there is a conveyor belt of rainbow macarons. After exploring museums and pop-ups, you may want to do some shopping. After all, this is New York. Stop by Broadway and Spring Street for the best shopping in the city. From Aritzia and Glossier to &otherstories and Primark, Soho offers a picture-perfect cobblestone backdrop for your shopping excursion. A trip to New York cannot be complete without seeing a Broadway show. The awe-inspiring energy of Broadway is absolutely breathtaking. What show’s on our radar? You really cannot go wrong with anything on Broadway, but if we had to pick our favorite of the moment, “Waitress” would take the cake. Located right outside the city, this posh tea house offers a fine selection of Asian-inspired teas and decadent desserts including our personal favorites: rose milk tea and green tea mille crepe cake. The perfect spot to check-in with your friends and chat over a pot of tea. With their beautiful floral printed coffee cups and rustic vibes, Maman gives us total South of France vibes. Be sure to stop by for your mid-afternoon caffeine fix and give their lavender-infused latte a shot (or two). If you like it strong and to the point, you’ll want to head to La Colombe for your no-fuss Americano. With eight locations around the city, it feels as though there’s a La Colombe around every corner (bless). Their mantra says it all: “we were together, I forgot the rest.” Serving the coolest cocktails, While We Were Young is the perfect ladies-night spot for you and your girlfriends. From “pillow talk” to “the morning after,” the drinks are most definitely a conversation starter. Did we mention that they have the cutest blush pink interior? It’s like it was made for us. Think James Bond meets Chuck Bass. Located on the 40th floor of the Aliz Hotel in Times Square, this cocktail bar offers breathtaking views of the Empire State, velvety lush seating, as well as New York-made spirits. Tried and true, Dear Irving is a spot for the books. That’s it, folks! We hope this Girl Gang Guide to New York inspires your next weekend getaway. Let us know if you stop by any of our fave spots!